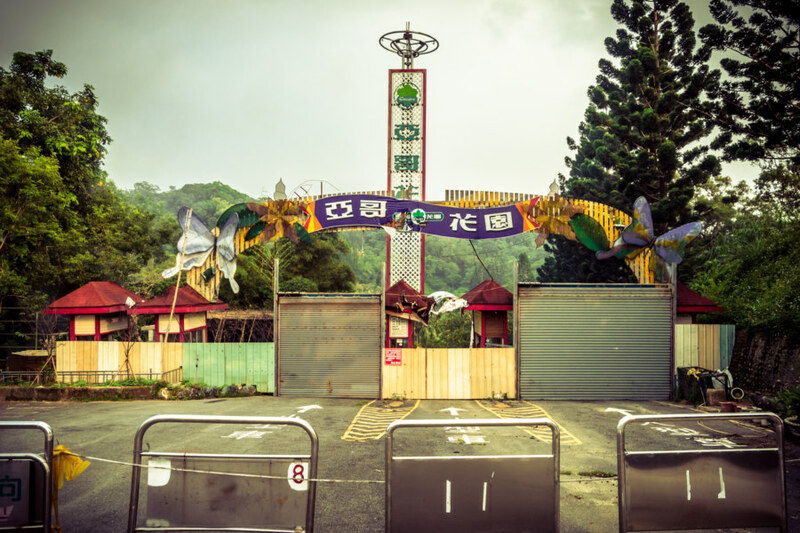 The entrance to Encore Garden, an abandoned amusement park in the hills above Taichung. 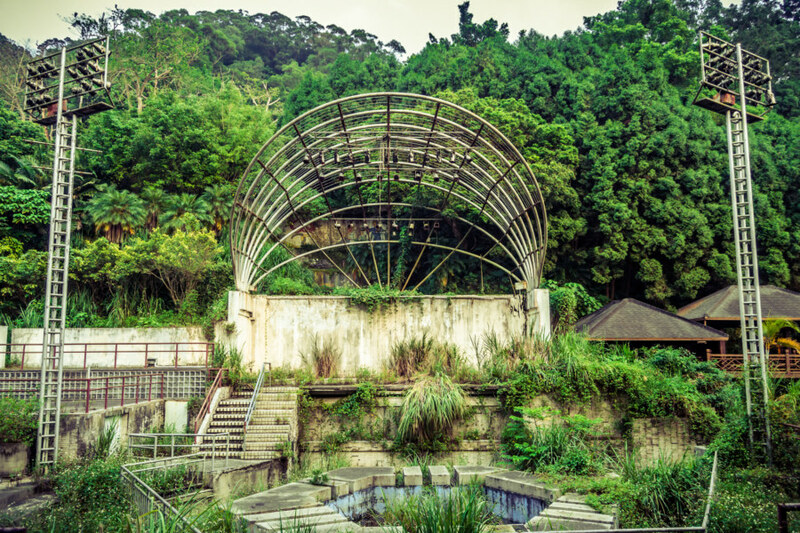 Encore Garden 亞哥花園 is an abandoned theme park in the hills above Taichung 台中 in Taiwan. 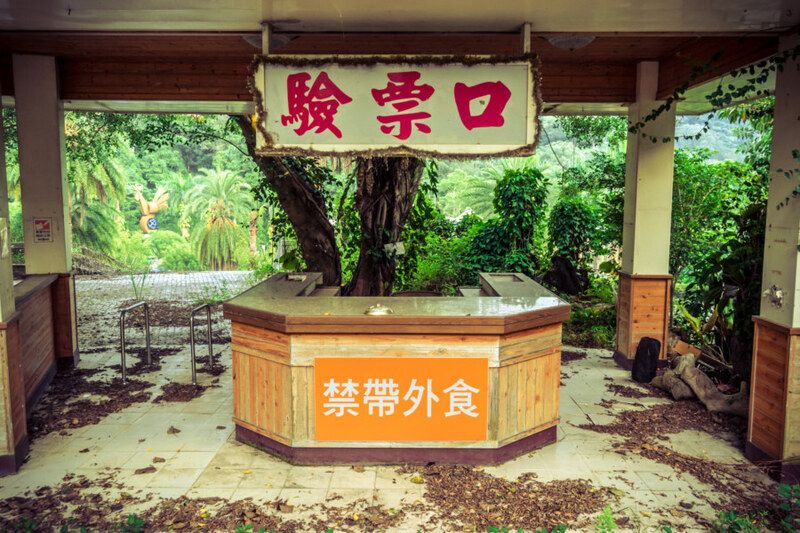 I learned about this urban explorer’s dream after reading up on Katolis World 卡多里樂園, another abandoned amusement park in Běitún 北屯. I was dismayed to find out that Katolis World was demolished years ago but then I found this post confirming the existence of another abandonment nearby. With the clues provided—and some Google Maps sleuthing; those Street View cameras really get around these days—I was able to identify a likely target in the hills above the main highway. Apart from that I knew very little about what I was getting myself into at Encore Garden—there is almost no other information available on the English language web. 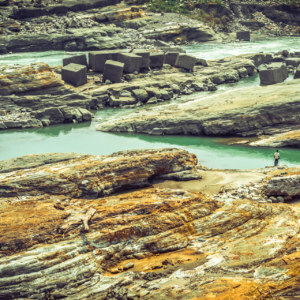 In September 2013 I set out on an epic bicycle tour of Taiwan. I made a point of checking out some ruins along the way—with Encore Garden near the top of my list. What follows is an excerpt of my bicycle journal for the day, capturing my thoughts and feelings as I explored this forgotten and neglected place. Cooking up a storm in the entrance. Is this the caretaker or just some random squatter? 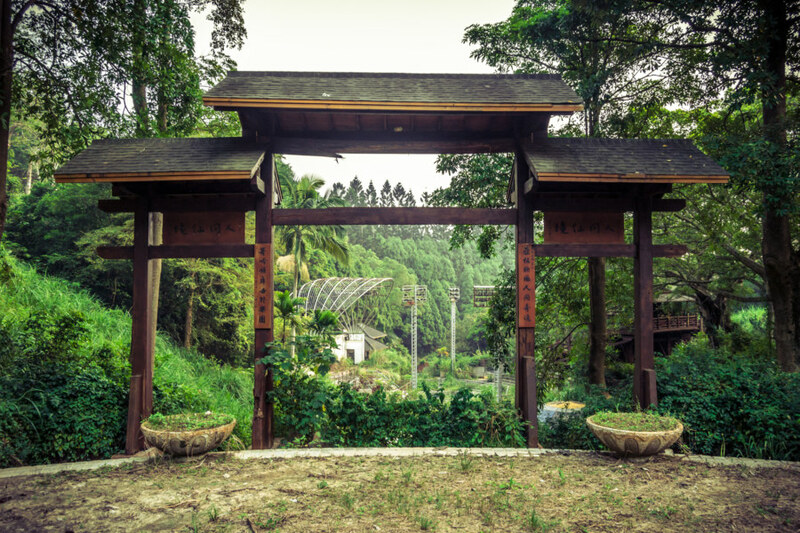 I arrived at the entrance to Encore Garden after a challenging ride into the hills of Běitún 北屯. 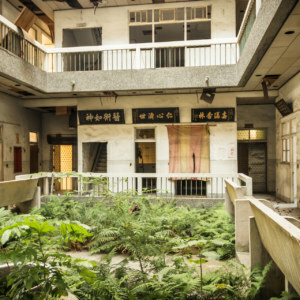 There was almost nothing else around—just a tree-lined embankment obscuring the insides of the theme park and one or two concrete homes to either side. 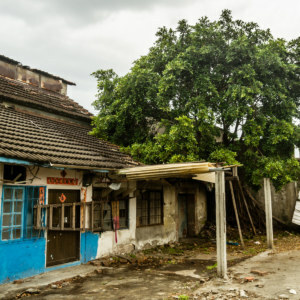 I let my hands slip off the brakes and cruised downslope, noticing a cloud of smoke rising from next to the boarded-up entrance as I made my final approach. Pulling into the small parking lot in front of the entrance I stepped off my bike, threw down my helmet, and wiped beads of sweat off my brow. Now to find a way inside! I walked over to the fence and saw an old man tending to a fire next to a stack of chicken cages. Evidently he has made a home here in the outer gate to the old amusement park—or perhaps he was the caretaker or security guard? He didn’t appear to have any sort of official look about him. At any rate, I greeted him in basic Chinese, brandished my camera, and pointed to the park beyond, meaning to communicate that I sought permission to walk in and shoot some photos. I was halfway expecting a flat-out “no” (méiyǒu 沒有) but he seemed amenable, motioning to the right side of the gate, almost as if to indicate where I might find an entrance. I thanked him and went back to my bicycle to scout around a little more. I took a cursory look at the exit to the left of the main gate. There was a car parked in front, blocking access to the fence, but I thought nothing of it until I saw motion in the back seat as I drew near. Neurons fired and I smiled knowingly: this remote parking lot must be popular with youth. 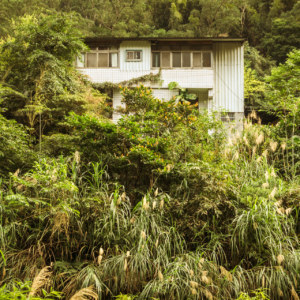 Just about everyone in Taiwan lives with their parents—and parents here are notoriously fickle about conjugal visits between the unmarried. Perhaps this is a sort of “lover’s parking lot”. Not wanting to disturb anyone I continued to follow the road north along the corrugated metal barrier along the roadside. Here there were no trees to obscure the view—beyond was a grand expanse of nothingness, just asphalt and some low-lying plants, forested hills rising above the horizon. I saw no sign of amusement park rides or buildings. Had everything already been demolished? Seeing no way through I spun around and went the opposite way, down the hill in the direction the old man had originally indicated. The slope dropped out from under me, steepening as I gripped my brakes ever more tightly. I knew I would have to fight gravity to come back up here later on. At the foot of the hill I stopped to scan the roadside. I saw a bunch of gardening projects strewn around, pottery and black plastic sheets beneath a tangle of trees. 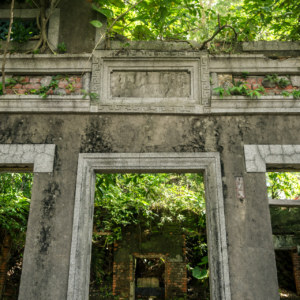 I pushed through dense foliage to check if there was a hidden entrance but ran up against a high concrete wall and a swarm of ravenous mosquitoes lurking in the shade. Clambering back to my waiting bicycle I took a hearty swig of an electrolyte drink, likely my fifth of the day, and pondered my next move. 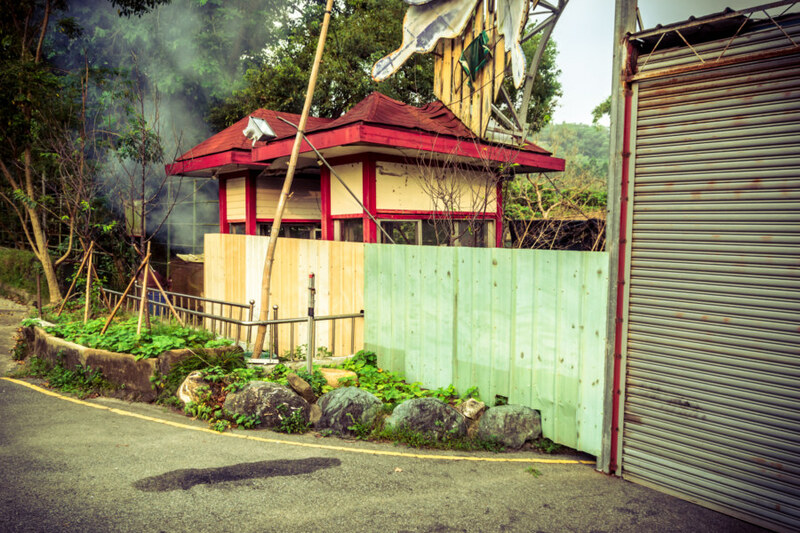 When nothing better came to mind I went back toward the main gate, doing my best to ignore the angry imprecations of a dog jealously guarding a shack to one side of the road. I walked my bike up the steepest part of the hill and noticed trampled plants at eye level. Stopping to hoist myself up the embankment I followed a short path as it twists through the trees, hope rising in my chest, only to find a rainwater cistern and no way to pass. At this point I was feeling quite flummoxed. It had taken considerable effort to make my way out here and I hadn’t yet seen much of anything. 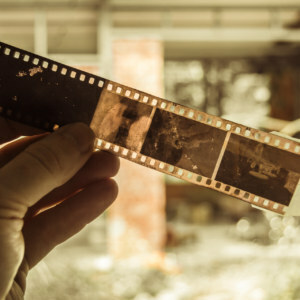 I was determined to gain access somehow—I was not willing to continue my journey without seeing more of this haunted place. Ticket booth at Encore Garden. I left my bicycle and all my gear at the roadside in the rush to enter Encore Garden, my camera slung around my neck. There was very little to see near the exit—just the fence and a lot of trees lining the paths leading downhill. I sidled down the asphalt incline, opting for a modicum of stealth as I approached what appeared to be a ticket booth or information counter of some kind. I wasn’t sure whether the old man had given me lousy advice or if he had told me to keep out so I had no idea whether he’d be incensed to find me inside the gates. I looked over my shoulder, wary and alert, but there was no one in sight. The park was nearly silent apart from the sound of the wind and the background hum of insect life. I stepped through to the far side of the ticket booth and a flock of birds erupted from a gnarled tree, startled by my trespassing. Beyond the threshold my gaze fell to the far horizon, tracing the contours of the overgrown structures at the heart of Encore Garden. Several large buildings were easy to discern but others were little more than shadowy outlines beneath nature’s rapacious resurgence. This place, once the domain of man, was returning to the wilderness. I set out to explore the park in earnest. The pathways leading from one attraction to the next were choked with weeds and strewn with leaf litter but otherwise navigable. I walked left, to the north, intending to visit the outermost buildings before angling into the heart of Encore Garden. A sign in the old amusement park. Broken glass outside the clubhouse. 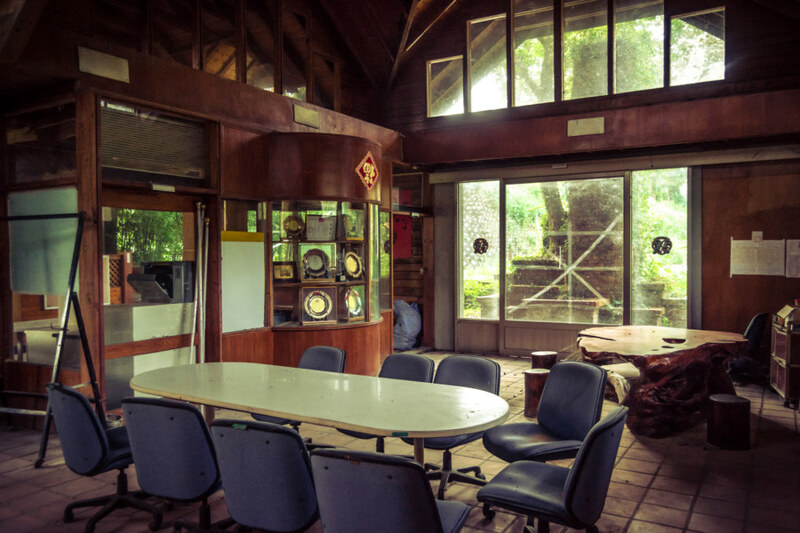 The first building I ventured into appeared to be some kind of office or clubhouse. There were trophies in glass cabinets, desks and chairs, and an assortment of clerical supplies scattered across the floor. 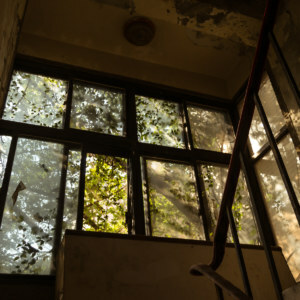 It smelled like mould and decay but the building itself seemed sturdy and sound. What plans and schemes were laid here? I wandered on, thrilled to be here. The next complex was almost completely unrecognizable beneath the overgrowth. I suspect several of the buildings in this area were once greenhouses—which means this part of the park must have been a botanical garden of some kind. Unsurprisingly, nearly every surface was covered with an explosion of plant life. 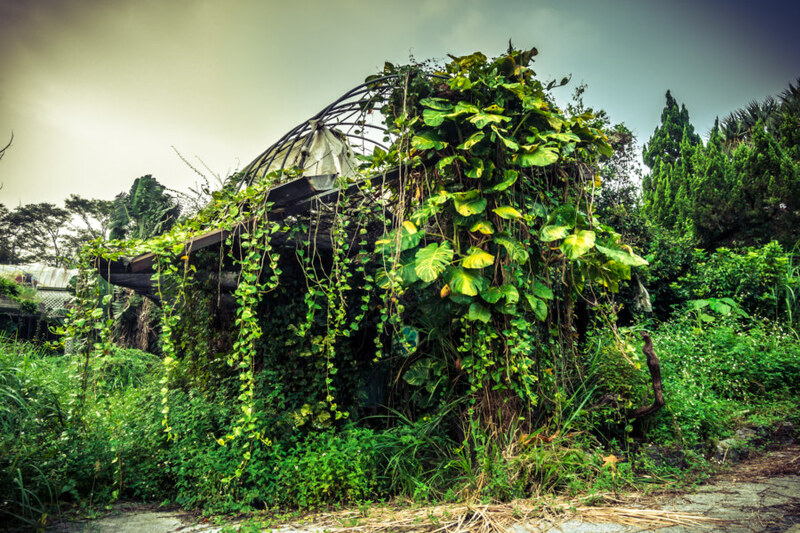 Weeds exploded from cracks in the asphalt while vines dangled from skeletal rooftops. 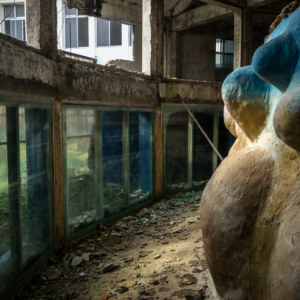 These organisms were no longer in service to human aesthetics. Nature was flourishing here, wild and free. 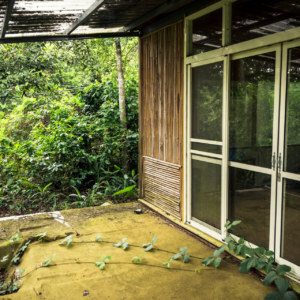 There is a building beneath the foliage. 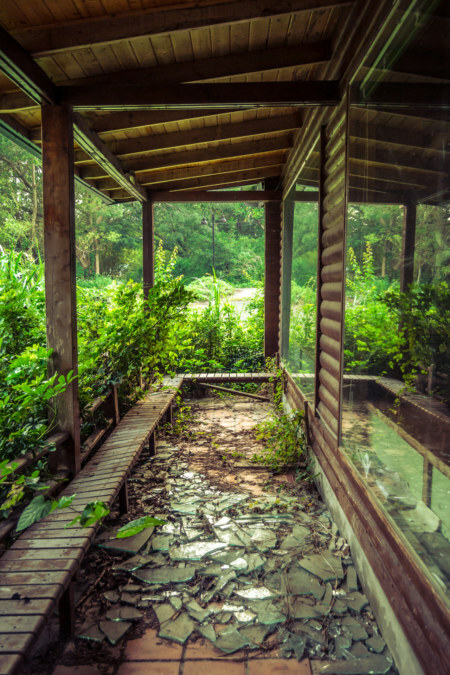 Everything in the park is being reclaimed by nature. 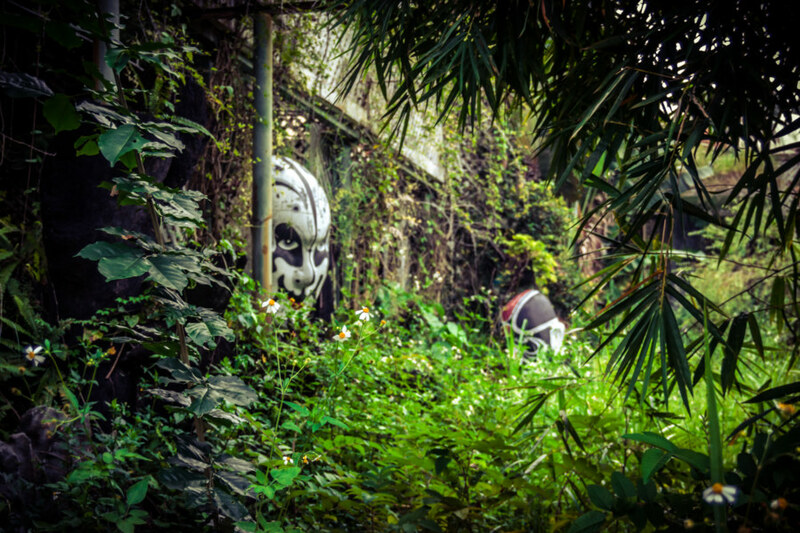 Through a dense tangle of plant life I noticed a painted mask suspended in the air. 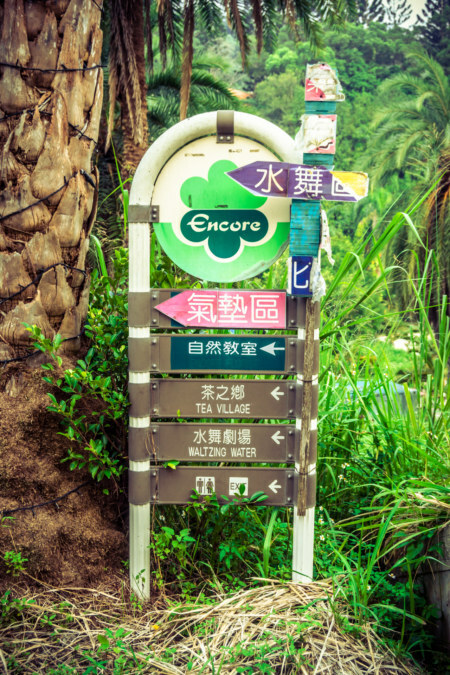 I recognized it immediately—a photo of it appears on the blog that originally introduced me to Encore Garden. Intrigued, I looked for a way through, but the most direct path was overgrown to the point of impassibility. I circled around, scanning for another way in, but found nothing. The entire area was terribly overgrown. Eventually I resigned myself to pushing through. Brambles and thorns dug into my naked legs as I passed. If only I had a machete! A face I will never forget. 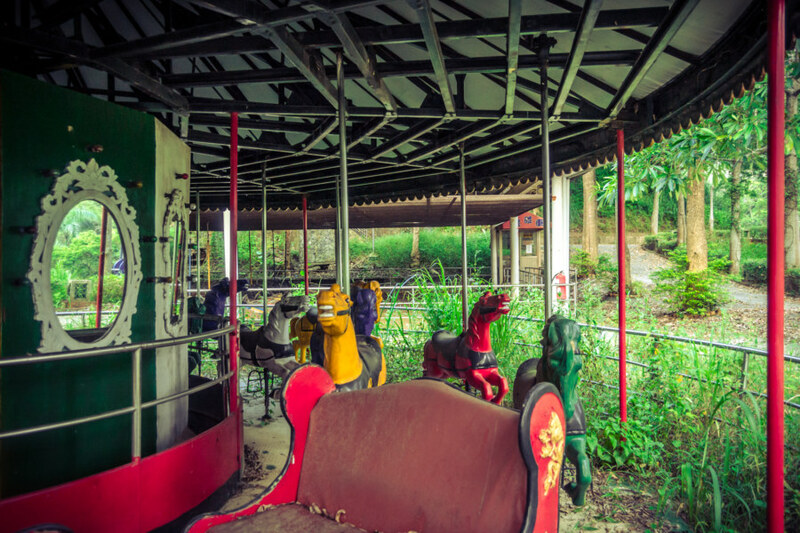 I found myself standing before a face floating in the windless shadow of a broken down greenhouse in an abandoned amusement park, a lone visitor very far from home. I was transfixed by its placid, inhuman gaze, lost in the eerie calm of this forgotten place. I let out a breath, not realizing that I had been holding one in, and admitted to myself that I felt slightly unnerved, maybe even a little scared. I am not a superstitious man and I do not believe in ghosts nor spirits. Even so, I could not deny that the creepiness of this place was getting under my skin, particularly since I was all alone. Had I been there with someone else I might have laughed it off—but to laugh without anyone around would have been the act of a madman. I felt a sinking sensation in my chest as I realized that no one even knew I was here. Suddenly I was not feeling so sure about this mission. I took one last look at the mysterious face floating in front of me, fixed its countenance in my mind’s eye, and stumbled back to the open path. I was completely disheveled. My legs were riddled with scrapes and my arms were pockmarked by mosquito bites. Dozens of tiny burs had affixed themselves to my shorts, socks, and shoes. I brushed off the worst of them and forged on to the next attraction. Animal house in the amusement park. As I approached the darkened doorway of another mysterious building it occurred to me that it would have been wise to bring the flashlight in the side pocket of my bicycle bag. Since I wasn’t about to return to the roadside I did the next best thing—I used the focus assist light on my camera to illuminate the interior. 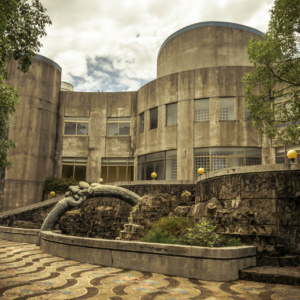 Despite all the trash I could see that the building was filled with educational displays, many of them about animals. I saw what appeared to be a phylogeny—a tree of evolutionary relationships—on the inside wall, a reminder of my university days. 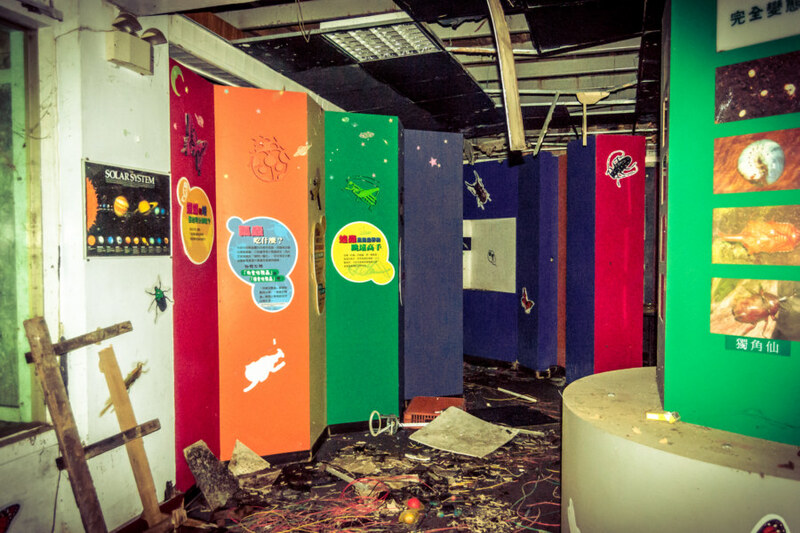 The other walls were adorned with fading photographs, posters, and placards. 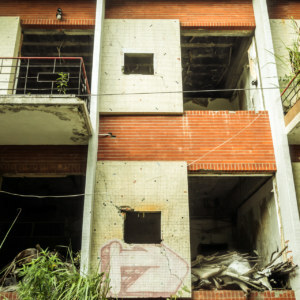 I chuckled to myself when I noticed cut-out pictures of insects as I left—surely there were a few live ones lurking in the ruins. I wandered on, blood singing in my ears, and spied several amusement park rides further down the path. These rides were neither extravagant nor unique. No, they were standard-issue, mass produced rides commonly seen at the carnivals that spring up in empty parking lots around the world. 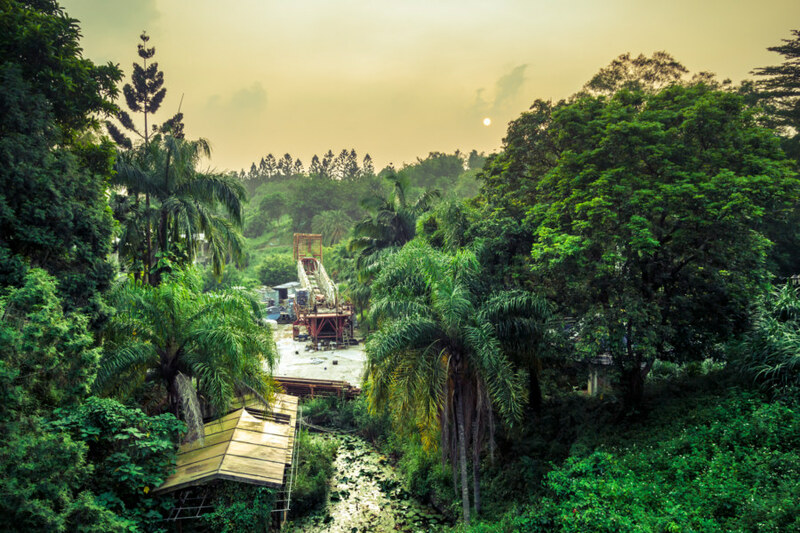 My thoughts drifted into the deep past and I imagined the park in its heyday, metal contraptions spinning and whirling in a twilight fugue, the sound of children’s laughter echoing into the subtropical jungle. 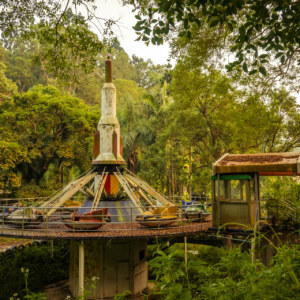 Years of neglect and exposure to the elements had infused the rusting hulks of these ordinary amusement park rides with a special kind of charm. This was particularly true of the merry-go-round and its frozen tableaux of whinnying rainbow-hued horses. I stepped onto the round to take a closer look and startled myself when I saw movement—but it was merely my own reflection in a mirror mounted on the inner hub. I couldn’t help but break into a wide grin after scaring myself so—what foolishness! This ride will spin no more. 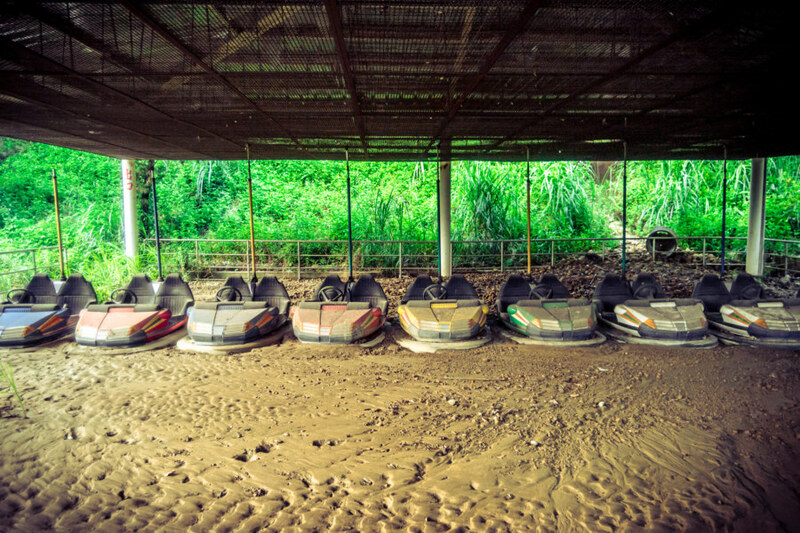 Bumper cars wallowing in the mud. 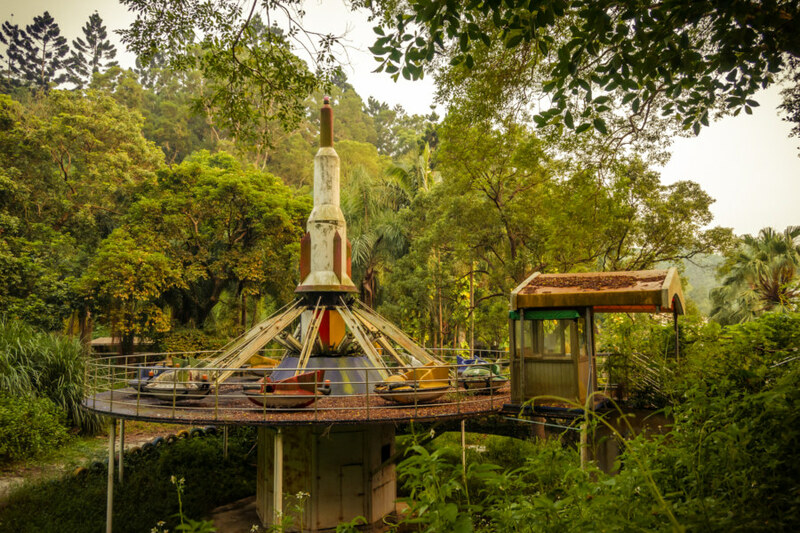 A derelict amusement park ride in the hills of Taichung. I went deeper into the park, moving with cautious deliberation, mindful of potential hazards like broken glass and rusty nails. I was particularly wary of venomous snakes hidden in leaf litter. On several occasions I froze in my tracks after hearing a telltale rustling in the undergrowth. I couldn’t be sure that it had been a snake slithering away but I swear I saw the glint of snakeskin at least once. I reached a crossroads and went left, hiking up toward the “tea village”. The path steepened and narrowed, leading me into the hills at the back of the park. The forest closed in, ever watchful. I went around a bend and an eerie calm returned as the rest of the park passed out of view behind me. Up ahead I saw a brown wooden building looming over the path. It looked dangerous, as if it was about to collapse, and I did not attempt to scale the rickety stairs to take a closer look. 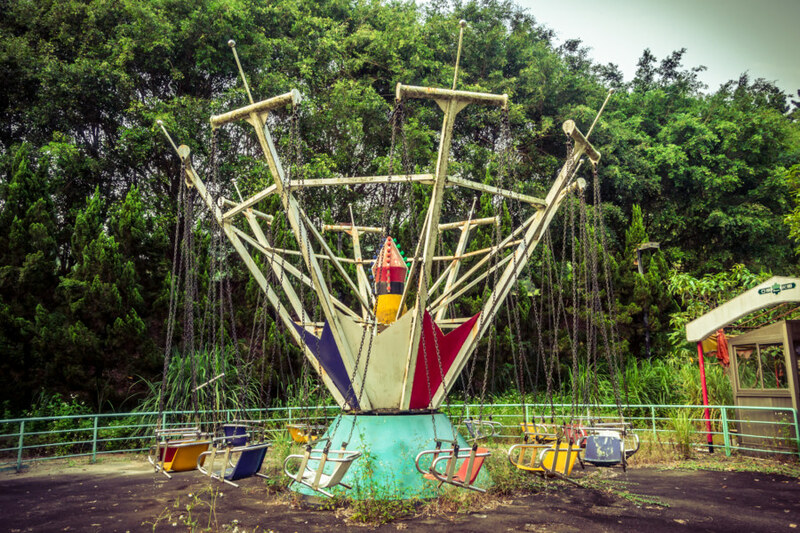 A silent sentinel stands guard over the far edge of the abandoned amusement park. 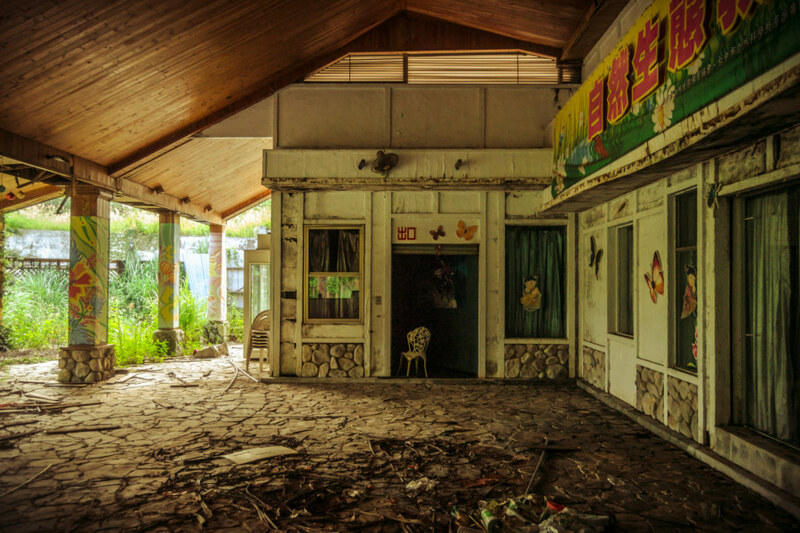 Beyond the old tea house, in the far reaches of the abandoned amusement park, the pathway came to an end. 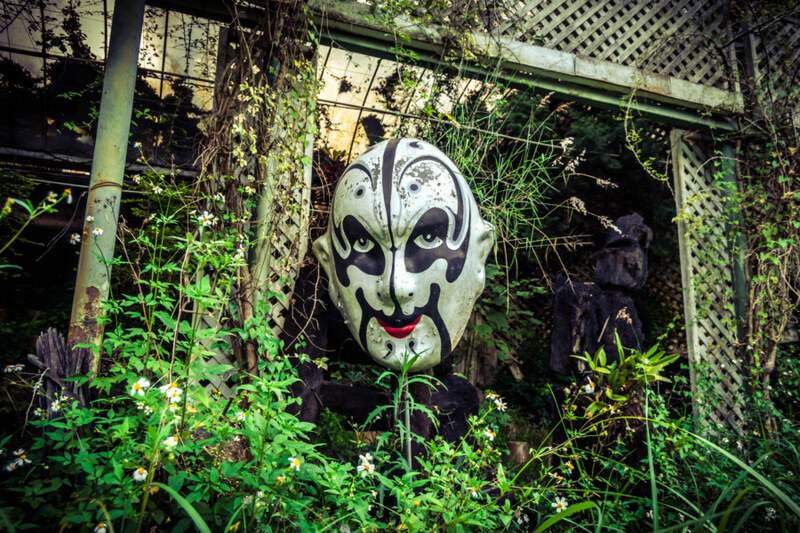 Here I encountered something easily as bewitching as the painted mask in the botanical garden. 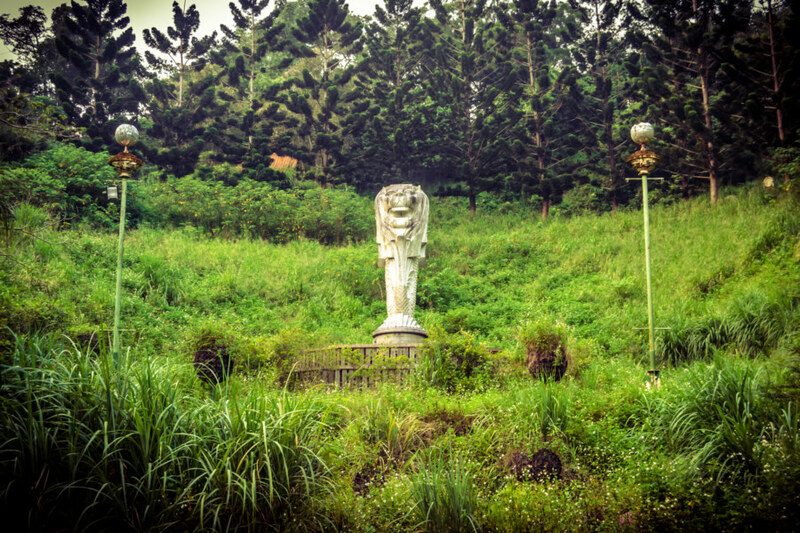 A strange stone statue was standing at the other side of the clearing, almost as if it were guarding the park. The grim-faced leonine sentinel stared down at me with regal eyes, daring this lowly mortal to request an audience in his otherworldly court. Once again I was mesmerized, overcome with uncertainty and doubt. And then I noticed the pikes lining the approach to the silent sentinel deep within Encore Garden. They were topped by weathered and cracked disco balls! The solemnity that has possessed the moment began to evaporate as I realized the absurdity of this decorative flourish. Disco balls? Really? Looking back from the end of the path through the paifang to the amphitheater beyond. I turned around and faced a páifāng 牌坊 opening onto an amphitheater. There must have been shows here once upon a time—the skeletal metal frame of a weathered old bandshell protruded through the opening. I ducked underneath the tea house, which is mounted on stilts, and followed the wooden stairs down to the concrete floor of the amphitheater to get a better view. The show was about to begin. The haunted bandshell by day. Imagine what spectral scenes play out here by night. I channelled my inner Hayao Miyazaki and let my imagination run wild. Time accelerated, gauzy cloud cover swept across the darkening sky, and as night fell in earnest a yellow crescent moon rose over the horizon, illuminating the bandshell with a spectral glow. Spirits emerged from the forest, reanimating old props and costumes. A ghostly pantomime was performed for a rapt audience of faceless figures that had sprung into view. And then, blinking, I let the scene fade into memory as I turned and left the amphitheater behind. The setting sun was my cue to depart. The swollen sun was hanging low on the horizon as I walked back down the hill to the middle of the park. An ambiguous mix of conflicting emotions churned beneath the surface of my outward cool. I wasn’t sure what to think or feel anymore, not after the last hour of wandering around this haunted place. In some ways I was simply worn out—I had been exercising parts of my inner self that seldom see much use, particularly the feeling of fear. I almost never feel scared but I was certainly spooked several times while exploring Encore Garden. And with that my mind snapped back to practical matters, leaving the abstract behind. I thought about the security of all my belongings at the roadside and the need to make haste. I quickened my pace and walked in the direction of the exit. I yearned to explore more of this fantastic place but knew my time here was up. Update: read more about this place here, here, and here. Some of my photos were featured in Apple Daily. Too bad they failed to credit me! The story of my day on the road continues here. Your writing and photos complement each other well. a little late to this blog post but that silent sentinel is a miniature version of the singapore’s merlion. It pretty amazing too say but I say it any way. This is the second time I visit this park and it safe to say the the first time was in a very vivid dream like state. It’s wonderful to know that some of us can enjoy a happy moment well shared with spiritual for telling to say the less and then finding it on the Wed. Miracles and dreams do happen. Thank you very much China…. Whats remarkable about this is your bombastic grammar asides from the storyline itself. Both are truely amazing and really appreciate it for sharing with us! Wish you have a great day!